It’s funny – no matter where I am in the world, I always feel a bit ‘short-changed’ when climbing hills. Something always seems to go ‘wrong’, either in the climb itself, or a general sense of disappointment upon reaching the top. Climbing Winter Hill (the clue should have been in the name) was no exception. As you probably know, I grew up in the North West of England, firstly in Liverpool and then the nearby coastal resort of Southport. 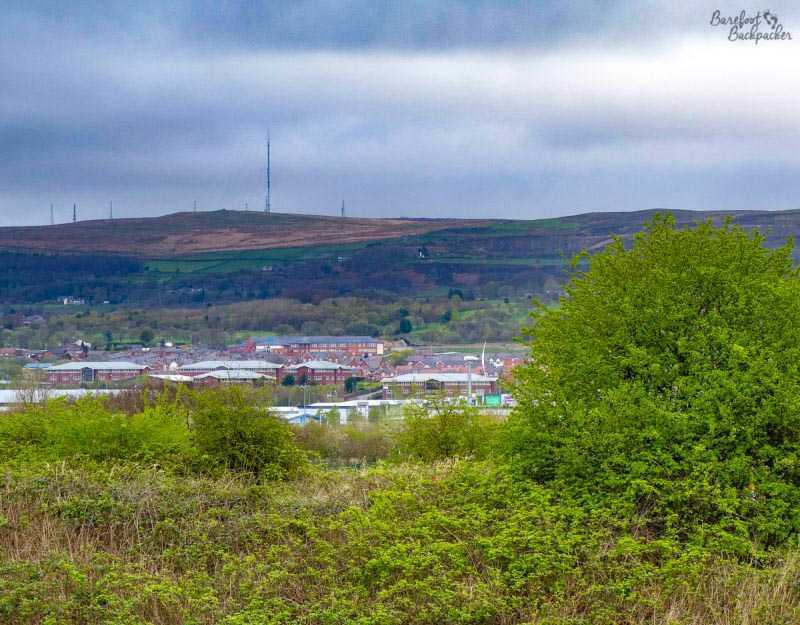 Our television signals came from the transmitter at ‘Winter Hill’ – in those days engineering work was advertised on TV and we were regularly informed when the signal would be affected, so we were all aware of what Winter Hill was. In my young head though, it meant it gained a mystical, almost mythical, property of being an important gateway to the rest of the universe. It was also far enough away for me to have never visited it; indeed I didn’t even know you could. The transmitters atop the hill. See, it looks nice and clear there! A visit to my firm’s call centre just outside Bolton enabled me to once again return to incomplete childhood memories. And I seem to have been given a wonderful day to visit – sunny and warm, around 17°C with bright sunshine and clear blue skies. Apparently you can see as far as Blackpool Tower from the top. And when I passed Horwich Parkway station, the TV transmitter was as clear as you’d like. 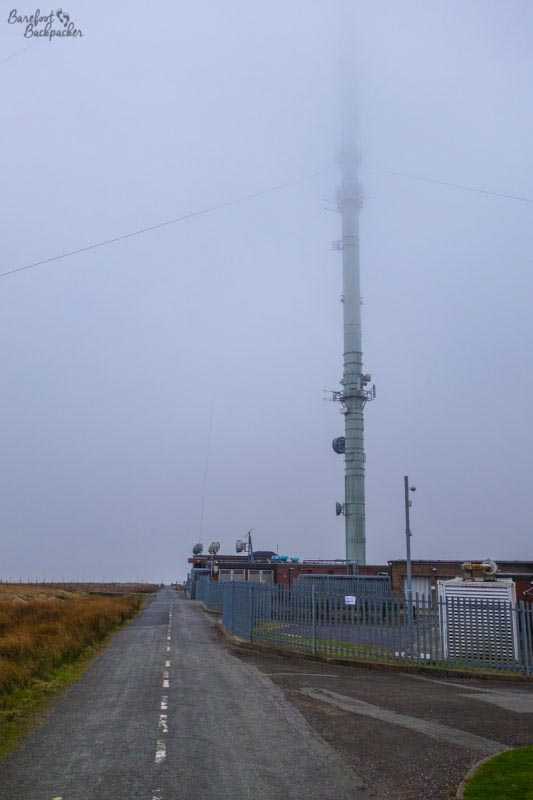 Winter Hill (456m high) is actually quite noteworthy outwith the TV transmitter, although that, along with the mobile phone masts scattered across the top, does make the place feel not a little ‘alien’ in the fog as tall frames with bulky bottoms appear out of the mist – iron-wrought frames, cold, industrial, weird metal skeletal hulks rising upwards with no sense of humanity or warmth. 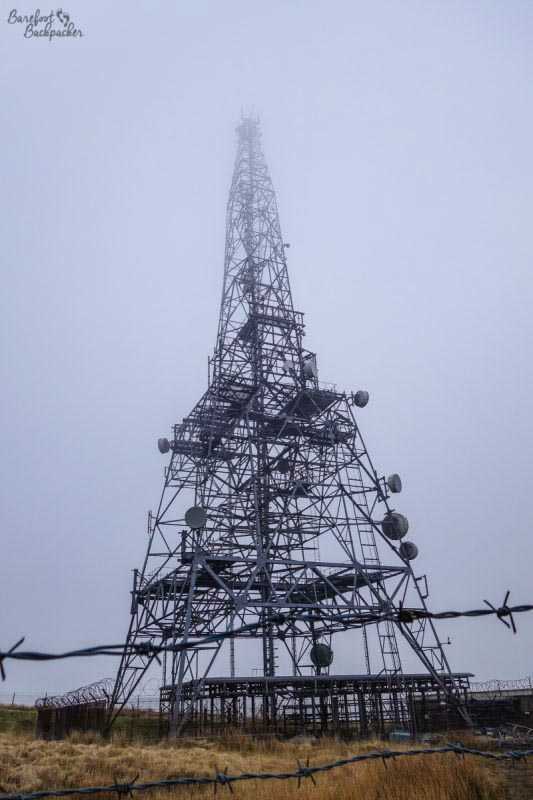 One of the telecommunication antennae, looming in the gloom. Towards the top of the summit are scattered some piles of stones; these are memorial ‘cairns’ and one is known as the ‘two lads’ cairn, supposedly constructed to commemorate the death of two young boys from ‘exposure’ while lost on the hill (I can definitely see how that could happen up here). There is a folk belief that they were the children of a Saxon King, but that feels unlikely somehow. The cairn, hidden from view by a frustrated backpacker. Near the TV tower itself is a metal pillar known as ‘Scotsman’s Stump’. 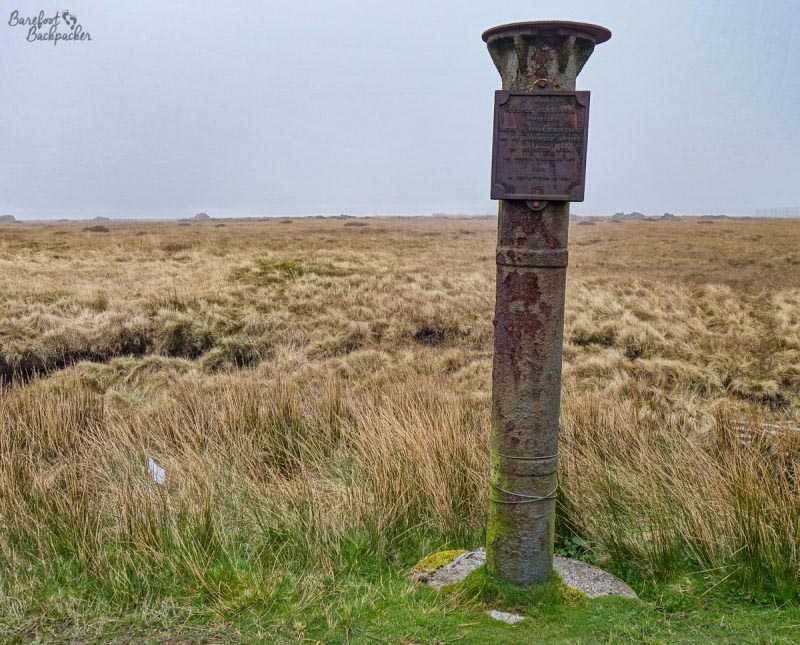 This commemorates a murder that took place here in 1838 of an itinerant Scottish merchant, travelling in the area and who was shot and killed by persons unknown (the only suspect was acquitted after two trials). Memorial to the murdered Scottish merchant. Seems a remote spot to be wandering through. And, as if there hasn’t been enough death already on the hill, two plaques (one on the TV tower itself, one on a gatepost just beyond) record the crash in 1958 of a chartered plane to the Isle of Man, filled with notable members of the car sale industry on the island, in weather conditions presumably similar to that I experienced – it crashed within 200m of the transmitter but no-one working there noticed or even heard the plane come down. 35 people died (7 survived), and the crash is still remembered on the Island. The cause of the crash was determined to be probable navigation error – in the fog the pilots had picked up the wrong transmitting beacon and had misread their position by a few miles. There had been other crashes on the hill both before and since, but this was the most severe. Memorial to the 1958 plane crash. Comfortable conditions for a barefoot hike, just a bit … cold! The climb up (pretty constant once I left Horwich town centre) was quite steep, and despite leaving in bright sunshine, the weather closed in pretty quickly. 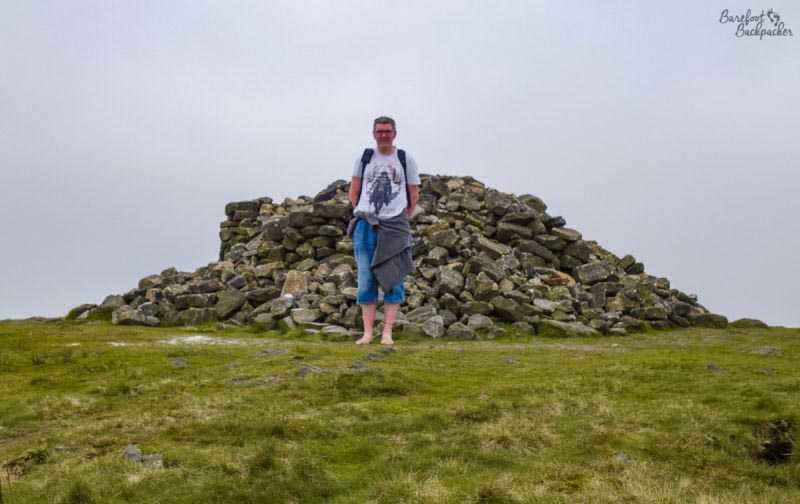 By the time I reached the ‘two lads’ cairn, it felt like a cool Autumnal day (though still comfortable enough to bounce barefoot over the boggy, mossy, ground), and once I reached the TV tower itself I was unable to see more than the base of it, the cloud was so thick, covering the summit like the metaphorical blanket. I could see the mist blowing across the road from the moor in the sharpening wind – one of those clichés that when it happens makes you realise what it means – and at one point it even started raining – that misty drizzle that gets inside your clothes and makes you realise that humidity is even worse in cold weather than in warm. The TV Transmitter itself, or at least all that was visible of it. Suffice to say I didn’t get to see Blackpool Tower. I could barely see the towers on Winter Hill itself. Coming up I’d just about made out Rivington Pike, the next major landmark to the North-West, and could see lots of people climbing up there. That would probably have been a better option, with hindsight (but though I didn’t climb it, one of my blogger friends local to the area, Kira, has written about it here). On the way down, close to the foot of the hill, I passed by a ‘memorial garden’. Except that this was no ordinary lawn with memorial plaques, nor even a standard graveyard. 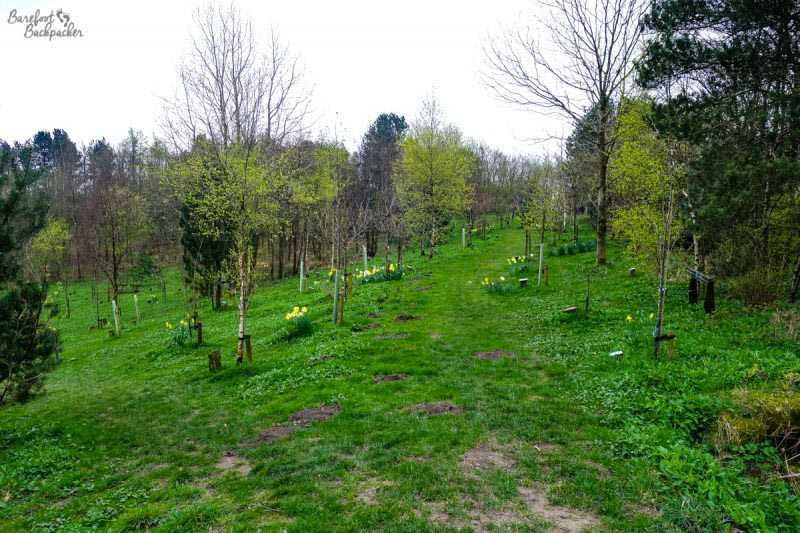 Rather, this is part of what’s known as the ‘life for a life’ scheme; a tree is planted on behalf of a deceased loved one, and their ashes are scattered in the roots. When the tree grows, it acts like a kind of ‘natural’ memorial, so rather than row upon row of stone markers, instead you have a living forest. It’s a pretty cool idea! Overview of the Memorial Garden in Horwich. 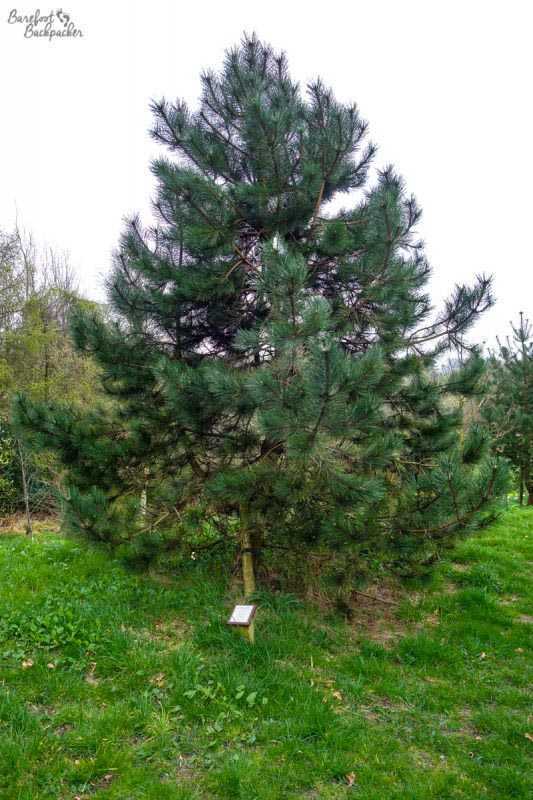 One of the trees in the memorial garden, dedicated to an 84-year-old who died in 2003. 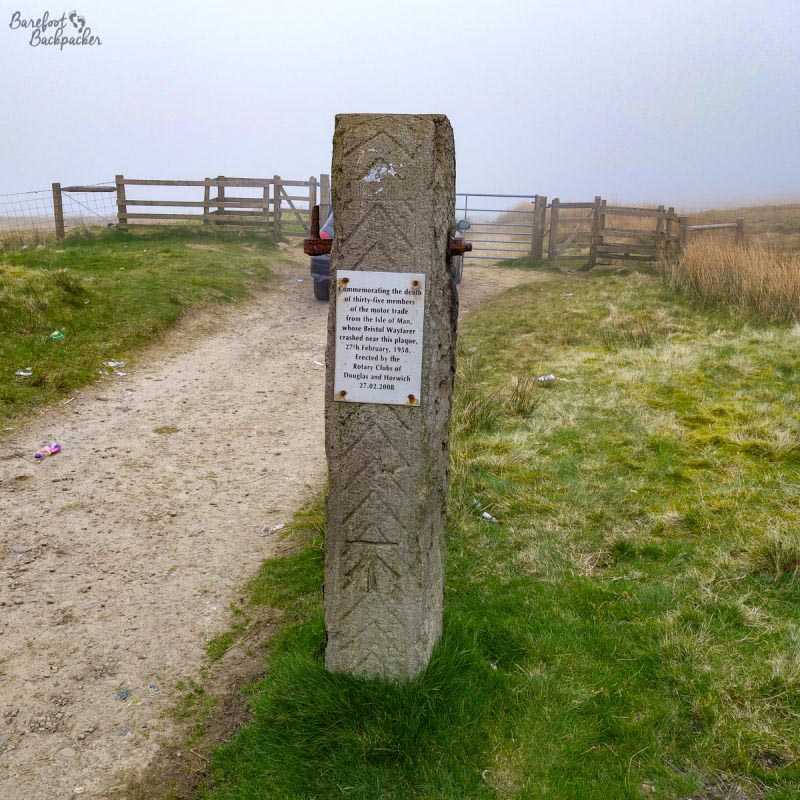 Authorities visited: Bolton, & possibly both Lancashire, and Blackburn & Darwen (The summit of the hill is the tripoint of the three). Date visited: 9 April 2017.